Fairly or not, the Riksbank has acquired the reputation as a serial procrastinator, having repeatedly signalled intentions to raise interest rates, only to delay lift-off repeatedly. Of course, most other G10 central banks have pursued similar strategies, but the Riksbank stands out, thanks to the interest rate forecast it publishes and the strong economic growth Sweden has recorded over recent years. Now that elusive rate hike is within touching distance. At its September meeting, the Riksbank gave a clear commitment that rates would go up in either December or February. The December meeting will put that commitment to the test. The key factor behind the Riksbank’s ultra-loose policy stance is the continued weakness in underlying inflation. Since the September commitment to raise rates, core inflation has undershot the Riksbank’s forecast by around 0.3 percentage points. While headline inflation remains above target, that is set to fall back too as the reduction in energy prices feeds through. We struggle to see material improvement until wage growth picks up (recent wage data has also been to the downside), and that is unlikely until the new labour union negotiation around in 2020. In addition to continued soft inflation pressure, the growth outlook has also worsened. The -0.2% QoQ Q3 GDP growth was very poor - the first negative quarter since 2013. Some of that can be explained by temporary factors such as the extremely hot summer reducing electricity output and the frontloading of car purchases in June due to a new emissions tax that came into effect mid-year. But new housing construction is slowing considerably, and household consumption was even worse than expected, and neither shows much sign of recovering soon. Household consumption was negative YoY in October, and consumer confidence according to the NIER survey remains below 100, indicating contraction. The housing market remains under pressure, and we think new construction will at best consolidate around current levels. What's more concerning is that a darkening global outlook has accompanied slower domestic growth. Growth in the Eurozone, which accounts for nearly half of Swedish trade, has slowed over 2018, while China also looks to have hit a soft patch. And even US growth, which has remained strong this year, seems likely to slow down in 2019. Combined with continued trade tensions and financial market volatility, this points to a downward revision to growth and increase downside risk. Set against this, there a couple of reasons why we are uncertain about our Riksbank call. The first is simply that policymakers may have a more optimistic assessment of the outlook, and could look through the recent poor data. The medium-term forecast is still fairly benign, and a single rate hike is unlikely to derail the Swedish economy. Policymakers arguing for a hike can point to inflation expectations, which have remained around target over the autumn, and the recent expansionary budget passed by the Swedish government will support growth next year. Secondly, markets seem to be, just about, expecting a hike now. So delaying yet again could prove costly in terms of credibility. 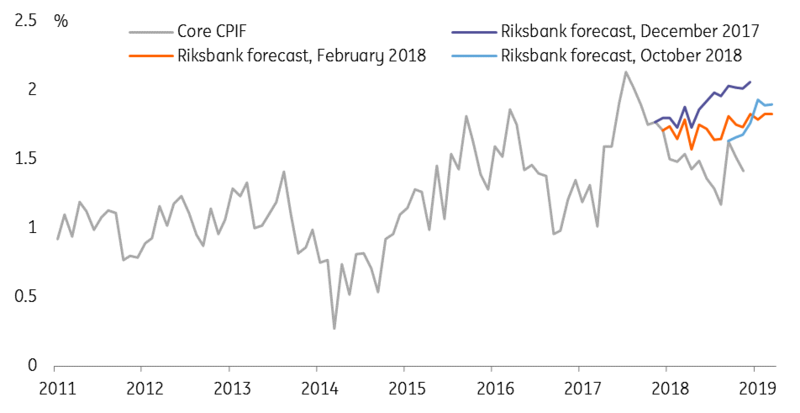 While we don’t believe the Riksbank would hike simply to meet market expectations (else they would have done so already! ), we do think policymakers factor in the need to maintain effective policy communication. To the extent, they believe that not delivering a hike now would reduce their communication credibility in the future, that could tilt what is a marginal call in favour of hiking. On balance we believe a further delay to the February meeting is the most likely outcome, though far from certain. This is based on the Riksbank’s previous reaction function, where any sign that inflation is not sustainably at target has led to policy loosening. The policy statement is likely to strengthen further the commitment to raising rates in February, though in practice there will always be some doubt about such promises. If policymakers do raise the rate, we believe they will deliver a ‘dovish hike’ by simultaneously lowering the interest rate forecast (similar to Norges Bank’s September hike, and also to when the Riksbank ended its QE programme last December). The current rate path implies a total of three hikes by the end of 2019. In this scenario, we think the path would likely be shifted to indicate only two hikes are likely by end-2019. With the outcome finely in balance, one thing we can be fairly confident about is that the decision will move markets around, especially with liquidity conditions impaired ahead of the holidays. Indeed, the one-week options implied volatility for EUR/SEK is at its highest level since the September meeting. If we are right and the Riksbank holds rates, that is likely to see the krona weaken, possibly sharply. Conversely, a hike, even with a lower rate path, would see the krona strengthen. A more unexpected outcome – either a ‘dovish hold’ indicating delays beyond February or a ‘hawkish hold’ with no change to the rate path – would translate into even more dramatic moves.